Remoteness and bareness have created, in Portugal, a way in which it is part of Europe geographically, but by itself – culturally, socially, economically, politically and psychologically. For this reason it turns to its own securing of land for resources and amalgamating of people. Portugal is outlined on the west and south by the Atlantic Ocean and on the north and east by Spain. As a result, Portugal is one of the most peaceful places to live. The inconsistency in landscapes are part of what makes Portugal so content to live. Islands are one accent of the island. There are three archipelagos that make up the islands. Small mountain ranges brace the western side of the country. Rivers intersect them and they plateau with green valleys, and granite or schist. Portugal’s greatest river runs east – west from Spain all the way to the Atlantic, cutting the country nearly in half. The climate is very temperate in Portugal. The sun shines without surrendering. Winters are pleasant and summers hot and dry. The number of hours of sunshine in the country per year comes to as high as 3,300 in the South, and 1,600 in the North, some of the highest in Europe. Property in Portugal is less expensive than the European average. Renting is also of good value. The cost of food is much is lower than other Western European Countries. 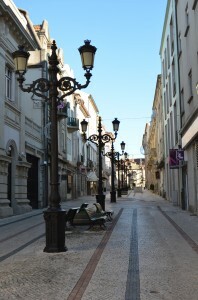 One of the most rare places to visit in Portugal, is the city of Viseu. Coming from the Roman word “viso”, Viseu gets its name from Roman dialect, meaning “good view.” It lies at the highest point between the Spanish border and the Atlantic Ocean. And its view is inescapable. The history of the city wavers through everything in it and a 3rd century Roman wall built to protect the city stands, as well as a gate. Within the gates of the Renaissance city is a plethora of artwork. Vasco Fernades is known for his painting of Christ and the apostles. The Museo Grao Vasco is where art from the famous Vasco, himself can be seen. They create artistic regard in Viseu, along with a mural made of blue and white tile forming country life backdrops. A twin towered cathedral, built in 1775 is the Cavo do Viriato. Vasco Fernades paintings hang on the wall of the cathedral. Against a street of eateries is the Praca Dom Duarte, a bronze statue of King Duarte. A great place to see old buildings. There is also a lot of stone detailing on doors and gates with tile accents on some. Parks and gardens sit in many areas, a place to enjoy some green lawns. Several dance and craft festivals are held in the city. Pacos dos Cunhas de Santar is a wine tasting house that has been converted from a 17th century manor house. To stay cool when sipping your ideal drink, visit the Minus 5 Degree Lounge. Everything made out of ice is brought in from glaciers from Canada.